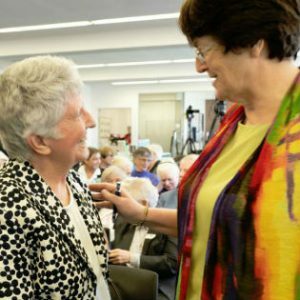 “Thank you for honouring St Vincent’s College by selecting from all your various and highly successful ministries, our ‘place’to launch your wonderful new history, Ministry of Love : The Story of the Sisters of Charity. While you are celebrating your 180th anniversary, we are celebrating that for 160 of those 180 years, St Vincent’s College has been a community where your ministry of love has been expressed as holistic Catholic education. Initially a co-educational primary school, but much more recognised as a day and boarding school for girls, St Vincent’s College has flourished through “different times, but same spirit” from 1858. When the school first started to operate in 1858, Abraham Lincoln was President of America, Queen Victoria sat on the English throne, NSW was still a penal colony, Charles Darwin had not published his theory of evolution, Alexander Graham Bell had not made the first telephone ring and the Eddison light bulb had not yet shone light into the darkness! Women around the world could not vote or stand for parliament, inheritance laws were severely weighted in favour of men and women’s participation in the formal workforce was extremely limited. It was into this world that dame the formidable talents of Sisters William, Cahill, De Lacy, Cater and O’Brien. With the generosity of spirit of the Irish Sisters of Charity behind them, these five Sisters started an educational enterprise that has continued to respond to the signs of the times! And what different times they have been! I want to use the metaphor of windows to describe some of those changes. Firstly because the views from these particular windows are stunning – day or night. To gaze from these windows takes me to sublime places and secondly we are in a library launching a book – a history book. Good authors like Danielle Achikian allow us to look in the windows of the past and again enjoy “the views” of a different kind of people and times. From this vantage point high on the Rockwall of Sydney, the early Sisters would have looked over Woolloomooloo Cove full of sailing ships, rural activity and early settlement. We now look at a bustling harbour, a city skyline unimagined by those who first settled here. At other times from that vantage point, staff and students would have been paralysed by fear looking out as Navies from around the world gathered before battle and indeed the war came right to us with the sinking of the Kuttabul at Garden Island. Other changes from these windows would have been the remarkable development of the Harbour Bridge emerging to forever change the city of Sydney. You might enjoy seeing the photos of this momentous journey on the walls of the library. Windows of the Convent and College have also overlooked activities of a rather more colourful nature. Many a tale has been told of gangsters, bootleggers, brothel owners, drug dealers sharing the streets and lanes around the college. Now we have much more sanitised views from the windows of respectable domestic and commercial establishments. I am not so naïve though as to suggest that all that looks so benign is indeed benign as crime has moved like everything else to the virtual world. Windows overlooking Tusculum Lane would have seen the hospitality and compassion of the Sisters as they cared for the desperate during the height of the depression. Students would have seen the respect shown and the care provided to those who came to the convent for food and conversation. Windows from the Boarding school must have been looked out longingly by the 1960’s girls who were almost within touching range of the Beatles as they stayed at the hotel on the corner of Rockwall and Macleay. They would have also been used forlornly for the long last goodbye to parents, or with anticipation of parents or visitors. One of the great changes we have witnessed has been the almost universal provision of quality education for girls across the state. But at different times in the school’s history it would have been necessary for families who valued a Catholic education for their daughter, to send her to board at a tender age of 5 or 6. Windows looking in and out of the school would have given visibility as the first electric lights appeared, as cars replaced buggies, buses replaced trams, and those looking in our windows now would see chalk boards now replaced with ever increasingly sophisticated and mobile devices that connect us to the world. The changes have been profound, but the spirit of Vinnies has remained the same. The girls call the spirit Vinnies spirit – that infectious, joyful spirit that touches everyone who spends time here. I know and the girls will come to now it is the work of the holy spirit.. 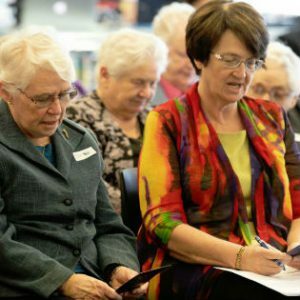 It sustains the community and it has been nourished by the ministry of love commenced by the Sisters and and now under the stewardship of Mary Aikenhead Ministries. I know how indebted I am to the tireless work of the early Sisters and all the Sisters who have given of their time and talent, to the students of the College since 1858. Today we treasure your story so well captured in the oral and written histories of the Congregation. Your history launched today will be a treasure chest for us to explore during book week next week – the theme of which is “Find Your Treasure”. We have much to treasure in your witness, your friendship and your ongoing connection with St Vincent’s College. I conclude by congratulating you on your 180th Anniversary and look forward to again immersing myself in the extraordinary story of your Ministry of Love in Australia. Thank you for coming back to this special place to celebrate with us today.